Wow! My biggest takeaway is that downtown cycling is approaching 1 in 10 of all trips! (More if we are just looking at Ward 19). 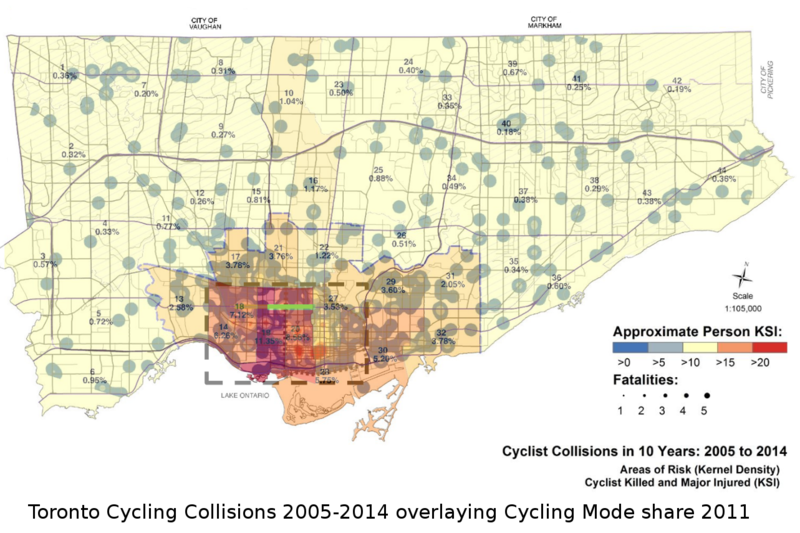 Cycling collison rates in Toronto 2005-2014. Source: Traffic Safety Unit, Transportation Services, City of Toronto. This is also quite interesting. The hotspots seem to be in the bottom of Ward 20 and top of Ward 28/bottom of Ward 27. Perhaps Richmond and Adelaide and some north/south streets. These results are over a ten year period from before the cycle track installations in the area. I mashed the two together to get a better idea of how they overlap. These areas are also areas of much heavier cycling mode share than in other parts of the city which increases the size of "KSI" (Cyclist Killed and Major Injured) as well. But for some reason Ward 19 which is at 11.4% mode share has fewer and smaller hotspots than the bottom of Ward 20 at 8.6% and top of Ward 28 at 5.8%. 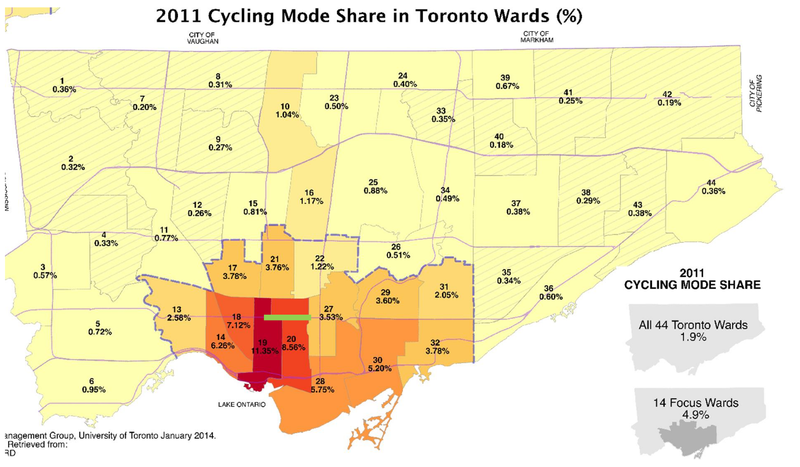 It is entirely likely that cycling levels have flucuated differently in these wards but I'm willing to bet not a whole lot. So I presume that those two big hotspots are particular areas of concern. And it makes me extra happy that we now have cycle tracks on Richmond and Adelaide. Let's now make them permanent and reinforce them even more. But I'm sure there are other streets of concern in the area. We can't know unless we get better detailed maps or raw data from the City. There is at least one collision that is not listed. It was at the corner of Finch and Wilmington on April 13th of this year. My son is healthy, thank God. He will eventually get his nerve back. Sorry to hear about your son Rabbi. I think the collision data is till 2014 therefore the latest injuries and deaths do not appear on the map. I see more and more cyclists at Finch & Wilmington and they need safe infrastructure. It just can't come soon enough! Thank you Alex. He is riding again. He will get his mojo back. With the pending development of the trail going from Maxwell down into the Don Valley Parklands, that corner will get even more traffic. I am not letting it go with Councillor Pasternak. Again, thank you for writing. I assure you that my son is the picture of perfect health. ...see @g_meslin's tweets: https://twitter.com/g_meslin/status/737396565267124225 -- using the Transportation Tomorrow Survey. When looking at statistics don't forget to look at the most recent deaths and how three of them were on the Toronto GTA borders. 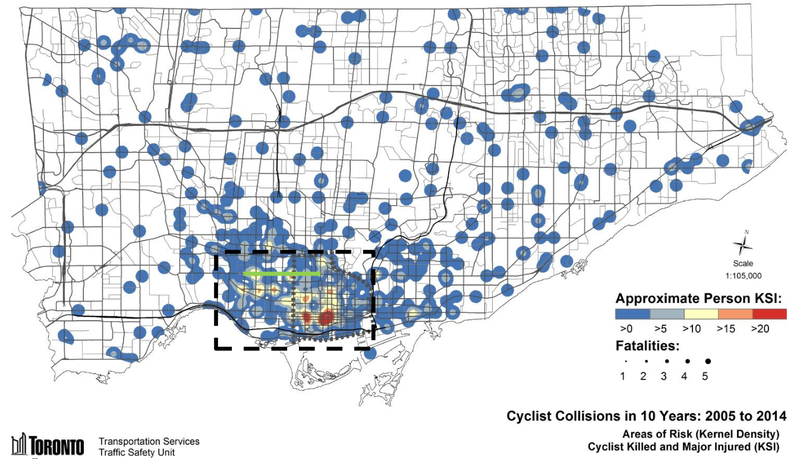 It is dangerous in parts of North York and Etobicoke, yet people still ride. Hardeep Singh Pahra died at 6AM because he had to ride between two buses to get to work on Steeles. Recent immigrant, two small children That part of Steeles is tractor trailers at high speeds. Second cyclist at Steeles and Dufferin.